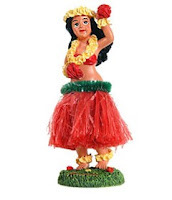 May the Blessings of the Hula Goddess be upon you! One of my players couldn't make the first session of our Mutant Future game, you know the one-shot that has now gone on for three sessions : ) So I worked him into the second session (summary of that one to follow soon, I hope) anyways I thought I would give you his background just to add a bit more info for those of you who might be interested in our Campaign. The below events took place during the events of session 1. Natorg (pronounced NAY-torg) listened intently to the trader's words... while he couldn't see him very well (with his diminished eyesight he couldn't see much beyond 50') his ears were fine, some would say even better than most. "Red Spotted Fever had broken out over in JymsWard and everyone knows you die from that. To make things worse a Healer that went to help was kidnapped by The Goatlords! Yeah, JymsWard was in a bad way, shame theres some decent folks livun there". Natorg wondered what toast was for a bit, but cast the thought aside as he made up his mind, he knew where the Goatlords lived, it wasn't that far away actually, if you took the right tunnels, he'd slip in and maybe just maybe he could rescue the Healer! He'd be a hero, and then maybe his people would let him sit at the fireside and share the choice cuts of rat meat and fungi bread! He couldn't help that his skin was deadly poison to most, why they held it against him, he just couldn't understand. Natorg geared up, made sure his latex yellow gloves were intact and untorn (wouldn't want to accidentally poison the healer! ), the moto sickle helm handed down from his grandfather on his head complete with his sell fone com unit headset (Hork said it was broken, but what did that idiot know, the hula goddess said he was jealous and the hula goddess was always right), he made sure the pride of his possessions the sacred, blessed hula goddess was securely fixed atop his moto sicle helm. Natorg prayed to her and she talked to him through the sell fone. Yes this was the right decision. He strapped on his short sword, (the others wouldn't let him have anything better than that) and headed out for adventure!! Several days travel to the west of Gaxville beyond The Mazes and "safely" below the eyes of the various gangs and mutant monsters that fight for control of the ruins above lies Ghetto Hall, a small underground community of mutant humans, although calling it a community is a bit of a stretch, the community is located in an old tunnel of the ancients (fortunately if the tunnel ever connected to Trog Territory that section has long since collapsed). They survive by fungi farming, and supplement their diet with any rats, and insects that they can catch. 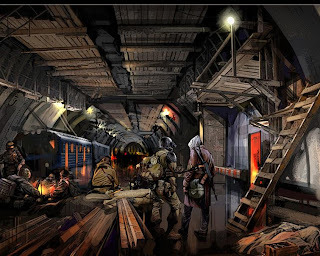 On rare occasions a trader will stop in to see if these tunnel dwellers have uncovered any bit of useful tech for trade. Unknown to most the community also has a water supply that is only "partially" polluted. The "Leader" of Ghetto Hall is Hork the Hairy, leader mostly because he is the biggest and strongest, he proclaims his undying love for the mutant female Scaleface, although she thus far has done nothing to encourage his advances. Scaleface is popular with the tunnel's denizens, should she ever agree to become Hork's bride that could change things in Ghetto Hall dramatically. I worked up Ghetto Hall and the info about it, however gotta give my buddy Michael credit, he worked up his character concept (including worshipping the hula goddess via his broken cell phone) on the spot from the random gear that I had him roll for, I use some crazy tables to see what kind of stuff they have just to add to the feel of the game. It's taken me forever to finish this up, I posted the campaign Introduction awhile ago, you may want to reread it so the below session makes a bit more sense. Now I'm two sessions behind on session summaries. I went the very detailed route for this one, will probably go a bit more streamlined for future ones. Anyways here it is sorry for the delay. With sickness quickly overwhelming the community, the elders (most of whom are quite ill themselves) are only able to find three individuals able to make the journey. The community’s two resident mutant plants (apparently immune to the disease); Cactus Jack and Prickly Pete wanted to go on the journey as well, but the elders decided someone must stay behind to man the walls and keep the beasts and monsters of the ruins at bay. The trio chosen by fate, more than anything else, consist of Bishop a chameleon skinned android of the ancients, Tink R. Bell a mutant human with a powerful damage turning ability and an uncanny knack for rigging technical weapons and gear and Sherman a mutant human with a quick mind and unfailing sense of direction (perfect to get the party through The Maze), don’t ask about his prehensile tongue. The group will set out at dawn with what weapons, gear and provisions that could be spared. They understood that time was of the essence, if they can’t get back in two weeks, they won’t have a home to come back too. Before departing Sherman spent time with the community’s lead scout Krash Helmut, who although too sick to make the journey himself, gives detailed instructions on how to find The Goatlords’ lair. Sherman sketches out a map and takes supplies to aid them on their quest, making sure he has his trusty Ball Peen Hammer packed. Bishop, is a relative newcomer to the community, he was found trapped under the debris and rubble of a ruined building by a recent scouting expedition into the wastes and was reactivated by the community’s Chief Examiner; Caractacus Potts. Bishop has no memory of his “life” before but serves the community loyally. He is presented with Caractacus’ own black powder rifle and a “brace” of Pub Darts to help with their mission. Tink in cooperation with Sherman used his mutant enhanced tinkering skills to maximize the most damage potential from all of their weapons. Tink also works on Sherman’s armored “coat” of scrap metal, mesh and bits turning it into something a bit more wearable and functional. Tink wearing his biker jacket and waving his family heirloom Cricket Bat into the air states that they are ready to depart! All three decided harvesting the Scorpion venom was a good idea and managed to get enough to coat their arrows fully (the group had been given two longbows and a rather limited number of arrows by the community elders before departing). While Tink did this, Bishop was able to harvest enough of the scorpion’s busted hide to rig some carapace bracers for himself. Sherman meanwhile exhibited a mutant power the others didn’t know he possessed; he quickly healed himself of all the massive damage he had suffered. Satisfied they resumed their journey. Heading deeper into the ruins and rubble, it was only Sherman’s innate direction sense that kept them from getting hopelessly lost. Along the way when time permitted they scavenged here and there, finding a bit of copper wire, some metal scraps etc. Time was of the essence so they tarried none the least. At one point they found a well made and curiously rust free wheelchair, with a human skeleton lying on the ground nearby. The wheelchair had an embossed “X” on it. Tink and Sherman studied it and found it could collapse into a small handy size for ease of carrying; it seemed to have a solar energy source too. They packed it away and kept moving. Tink and Bishop continued to be impressed with Sherman’s ability to navigate the ruins, where they saw only endless rubble he seemed to clearly be able to discern a path. The day progressed; occasionally a rat or other unseen beast scurried about in the ruins. The rubble became more and more difficult to travel, yet Sherman kept to the path. Moving ever closer to their destination they avoided a web-filled alley, giving a shudder at the humanoid shaped forms encased in the webs hanging far overhead. 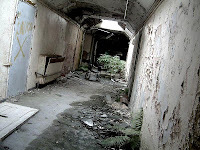 Picking their way through the ruins and rubble they soon found their path filled by a low hanging purple fog-like haze that emanated from the sewer grate of a nearby building. Bishop cautiously entered the mist, guessing his android form would protect him from whatever effects it might have. Using his Android enhanced senses he analyzed the mist and determined it was in fact some form of hallucinogenic gas, harmless to him, but definitely a problem for Sherman and Tink. Another way around would have to be found. Bishop proceeded to move through the mist, unfortunately the purplish haze obscured a nearby open manhole and a cluster of amoebae-like ochre tentacles lurched out and tried to grab the android, he managed to barely leap out of reach of the beast. Realizing being on his own was quite dangerous, Bishop quickly got out of the mist and worked to regroup with the others. Tink and Sherman picked there way along a different route detouring through several collapsed buildings but were luckily once again able to stay on course thanks to Sherman’s innate sense of direction. With the trio together again they continued their journey, darkness was fast approaching, and Sherman in particular was concerned about being out in the open at night, maybe it was from his conversation with the community’s scout, but everyone agreed that secured shelter was a must. With dusk upon them they finally found a suitable building to camp in for the night. An old Quickie Mart of the Ancients, still fairly intact, at least compared to the other buildings nearby. They quickly worked to secure it and fortify their position moving old shelves and even an old aisle cooler to cover the door and windows. They found an old box of nails that Sherman pocketed as well as some other bits and bobs. Not wanting to risk a fire, they huddled quietly in a back corner of the building behind an old freezer; they set up watches and tried to rest. During the night they heard eerie sounds outside, risking a look, Sherman and Tink (both able to see in the darkness) spied two hunched over scaly grey humanoids creeping about in the street, the humanoids were tearing into the corpse of a goatman. The trio watched the grisly meal in silent horror; eventually the two humanoids dragged the remains of the goatman down into a sewer hole and disappeared. Shuddering the trio kept extra quiet for the rest of the night; none of them slept soundly knowing what was lurking just outside in the shadows. At dawn they headed out again, Tink suggested they cover any manholes or notable sewer entrances with rubble and debris; everyone thought this was a good idea. It ate up a bit of time but if they rescued the Healer they’d have to come back this way, and the harder it was for those things to move around the better their odds of making it back to JymsWard alive and uneaten! Dawn finally came, not soon enough for some, but with renewed purpose they set out. Sherman continued to map out their progress on the parchment he’d gotten from the community’s scout; Krash Helmut, he wondered if the kindly old scout would still be alive when they returned. Pushing such thoughts out of his mind he looked about and realized they were making better time than had been predicted. They should reach their destination sooner than expected. In order to maintain the field Bishop had to remain in place, which meant he was taking damage from the now burning building that he had been hiding in. Just then another goatman emerged from the roof access of the skool a big burly one with a massive axe, he was dragging the bound healer that the group was sent after. It looked as though the beastman intended to drop the poor healer off of the building, or at least threaten too. However before he could do this, Bishop switched the field to make it look like this new burly goatman was the wasteland horror and so the armored goatman started unknowingly blasting his ally. After a bloody fight, the goatmen were dead, Sherman rescued the healer and his medical bag from the skool building now also on fire, Tink recovered the laser pistol and armor, Bishop dropped off the burning building, his illusion field no longer needed. He was alive but badly burned; he wouldn't pass for a human anymore one entire side of his body was visible as being metal the synthetic skin had been burned away. But the healer was alive, bruised and battered but alive. They had rescued him, in spite of incredible odds and even had saved his medical bag, they could still save their community. 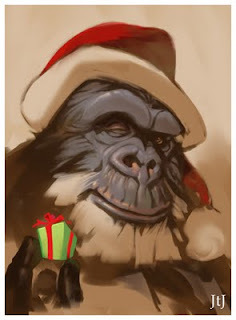 I hope the Simian Santa brought you lots of cool presents this year!! I hope this Holiday Season finds you surrounded by family, friends, love, joy and peace!! 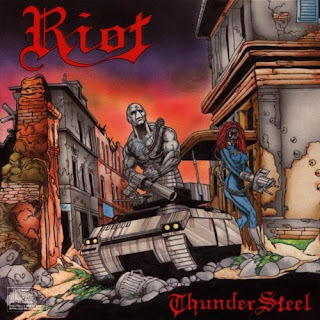 A Merry Christmas Gamma-Metal Shout out! My buddy since 8th grade (which trust me was a looong time ago) Tormentor sent me a little surprise Christmas Present which came today. He knows I love 80's Metal (yeah I know I'm showing my age). 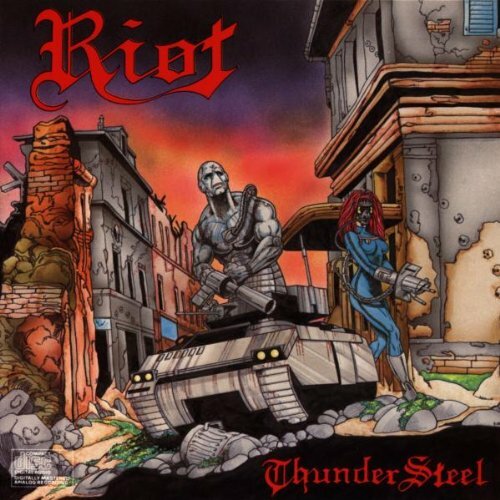 He found a group neither of us had heard of before: Riot. Hey cut us a break there was no internet back then. : ) Anyways here is the album cover. Is that image perfect for Mutant Future or what? I may have to stat this pair up for my Campaign! 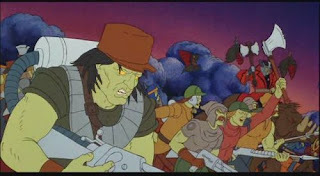 Call me crazy but Christmas makes me think of Heavy Metal and Gamma World! Before you think I'm off my rocker let me explain, my cousin would fly into town from California to visit every year over the Christmas holiday and stay with us for two weeks, he'd bring a sack of cool Heavy Metal cassettes (that's what came before CD's for you gentle young readers) to show off to us (we didn't have access to such music in our town back then) , Tormentor would come over and the three of us would listen to Heavy Metal while playing non-stop marathon sessions of Gamma World for days on end, we'd play without sleep until we'd get so cranky that we'd end up fighting and our folks would send us to bed! Good Times!! Merry Christmas!! We may be hundreds of miles apart but some memories and friendships never fade! Another Successful Mutant Future Sunday! We had part three of our ongoing Mutant Future Campaign today. I'm sorry I'm terribly behind on posting about it. Will try to get session logs up soon, so forgive me for being a tease, but it was a blast! Did they rescue Brother Thomas in time? Did they get lost in The Mazes? Did they make it through Trog Territory in one piece? and what lies in the Church of St. Vermaine? The gang is really getting into it and so am I, wild fun! I thought today might be the wrap up before we moved on to something else as they had finished the story arc that I had worked up, but everyone indicated they really wanted to keep playing! So continue the campaign we shall! Interesting how this one-shot turned mini-campaign is turning into a full blown Campaign! Good Times! Others have talked about it and I have to chime in about a new Retro Sci Fi RPG, Stars Without Number. It is a sweet looking game, very well put together. Gotta give kudos to the author. I've been in a Sci Fi mood for awhile now and had considering dusting off my old Traveller books or getting some of the Mongoose Traveller books to maybe run some Traveller at some point in the new year, but after seeing this FREE rules-set I'm really thinking Stars Without Number is what I've been looking for. Old Retro gaming based off the classic D&D system artfully merged with Traveller. Good Stuff! Plus the author has tons of helpful stuff for a GM wanting to run a Sci Fi Sandbox Campaign! That was always something I struggled with a bit in my Traveller games of yesteryear. When your players can be on a different planet at the punch of a Jump Drive, ya gotta be on top of your game to make the new worlds seem unique and different. Stars Without Number has tons of features to make doing that much easier. Oh and you guys know I love mutants and mutations, as an added cool factor, the next big release from the company according to the author is Other Dust, which will add a post apocalyptic Earth and mutations to the mix, Sweet! Looking forward to seeing more stuff from this author/company. Hmmmm now where did I put my old Alternity Campaign notes? Definately some stuff in there I can use! 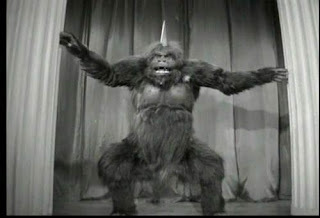 Another Simian Saturday is here, where does the week go?? 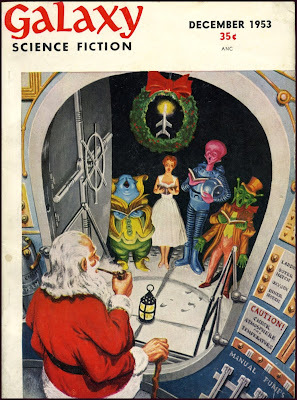 This one goes out to Clovis Cithog, from the Jasoomian Dreams blog. His blog is dedicated to classic gaming on ERB's Barsoom. 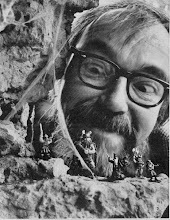 His site features some awesome Miniatures for the setting ,as well as, stats for some of the classicly cool Barsoom Beasties. Oh word of caution, if your at work some of the minis featured on his site are in true Barsoom garb, in other words the ladies are in NO way over dressed. He was even kindly enough to send me a copy of his rules RED PLANET to look at, I've been terribly remiss and not given him much feedback about them. Hopefully this shout out will help make up for that. 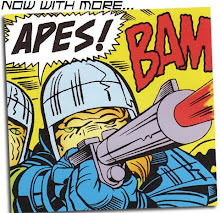 Simian Saturday : A bit late today, but I've got a great excuse! Guess which one is me! The fortified community of JymsWard has long been a bastion of hope and tolerance in a hostile world. 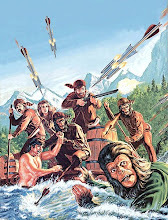 Though predominantly human, the community consists of a variety of races; mutant and pure strain, animal and plant, all working together in order to survive in a world gone mad. Located near the heart of a vast ancient ruined city, JymsWard survived when other communities failed. 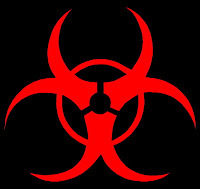 Recently however, a new threat to the residents has emerged, not some fearsome mutant monster from the wastes or some diabolical living metal monstrosity but a more insidious danger, disease! Crimson Spotted Fever has struck the community; even the strongest members have been sickened and affected by this horrible mutated disease. 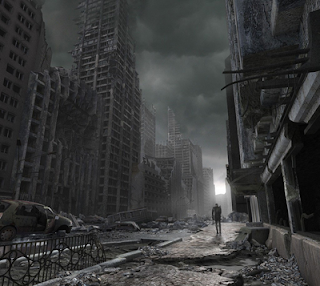 Other towns, villages and communities in the outlying ruins, upon hearing of the outbreak, ceased trading with JymsWard, further adding to the people’s suffering. Cagetown always a rough and tumble place even went so far as to declare any refugees from JymsWard attempting to enter their town would be shot on sight. It was hoped that the Excalions of Knighthaven would be able to help, but those noble lionmen are currently engaged in a fierce battle to contain and drive back yet another outbreak of the hungry dead from Deadside. However, not all hope is lost; word reached a travelling Healer, Brother Thomas in the nearby village of Wormhaven of the outbreak, Brother Thomas having the cure to this disease immediately set out for JymsWard in the hopes of saving the community. 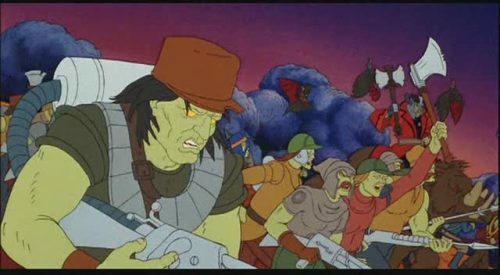 Somewhere along the way he was ambushed by a relatively new but nonetheless vicious gang of mutant goatmen, that have dubbed themselves The Goatlords, this raider gang is believed to be allied with the Zoopremists Cryptic Alliance, they somehow learned of his journey and kidnapped the kindly healer. Only the most vile, evil and foolish of folk would actually physically harm a member of The Healers, so The Goatlords offered him to the people of JymsWard for an unreasonable ransom. A ransom they simply cannot pay. The JymsWard elders desperate, but still holding out hope assembled the few remaining healthy townsfolk that could be spared for a desperate journey. Something The Goatlords would not expect, a surgical strike into the heart of their territory to rescue the healer and bring him back safely to the dying community. They estimate at most the community has six to ten days before the plague reaches critical mass, after two weeks the team has been told there is no point in coming back at all; it’s a three day journey to The Goatlords lair, time is running out! Mutant Future Money: Silver and Gold and Bottle Caps? 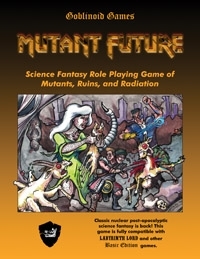 My Mutant Future Campaign has its second session this afternoon, Woo Hoo! Things are going well, the guys are taking to the game way better than I expected actually. None of them have played a P.A. RPG before, but they all adapted very well last session and quickly started working as an effective team to overcome some tough opponents! I think the recent Fallout New Vegas release has everyone in a Post Apocalyptic gaming mood. One issue I'm still trying to make a decision on is how to handle money in the campaign. Mutant Future uses the Gold Coin standard, which makes since for the game designers purposes, but I'm not sure that is the sole way I want to go for my campaign. The players rolled their starting gold bought their gear and then headed out. However, do I want them finding gold coins as treasure on a regular basis? Sure I can see it potentially having value (look at the markets today for an example, every time I turn on the TV or radio someone is saying to "Buy GOLD! "), I can see some cool adventures with them raiding old vaults and such for gold, but wouldn't there be other money systems used as well? 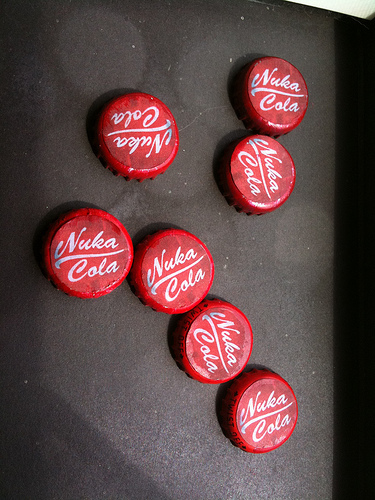 Fallout uses the cool Bottlecaps concept. Which fits the Fallout Retro 50's style setting perfectly, but I'm not sure it works for my current campaign. 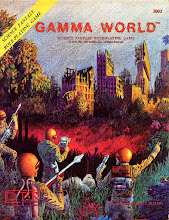 Darwin's World uses Corium (a rare and dangerous to harvest metal found at the bottom of old nuclear reactors) and Classic Gamma World used the Domar, a type of money of the Ancients. Anyways I was just curious what the rest of you Mutant Lord's were doing in your games. Woo Hoo! Reached the 100 Followers Mark! I think that qualifies me for Mutant Horde status doesn't it? ?Thanks for everyone who takes the time to read and comment on my blog. I really appreciate you all. I've only had this blog up for a little over a year, and in that short time I have met some really awesome people. Some might call it strange that I consider some folks that I've never met to be friends, but I have indeed made some great friendships thanks to this blog. You guys are the best!! 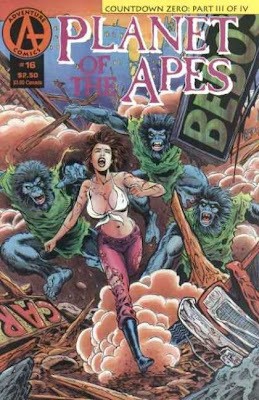 Simian Saturday: She's having a Bad Day! It's official there will soon be a revised edition of Mutant Future in regular distribution, with some new art and a new cover! Sweet!!! Guess I need to get caught up on posting about our ongoing Mutant Future Campaign, we have another session tomorrow! Woo Hoo! Minis Madness on a budget! As you all probably know by now I'm a Miniatures Nut but all that lead can be pretty darn expensive! Oh some of you have emailed me asking where I get these great deals. This batch is from Game Hollow but I've also had great success with Miniature Market (Game Hollow is a bit more on shipping than MM). Another company I've used in the past is Auggies great service and prices although he doesn't have as wide a selection as he used to (guess I bought it all up! LOL). Anyways thought I'd share some of my minis resources with you. When I get time I'll rebase the Heroclix minis, but its Finals week for me so back to studying!